On the hill (277 m above sea level) that rises above the town of Louny is a wooden observation tower (12 m high) from 1911, the so-called Frotzel´s Observatory Tower. 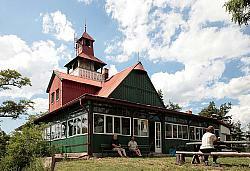 Part of the tower is the Ejem´s Cabin, which is used for refreshments of tourists. Access to the tower is also possible. The interesting hill (318 m n. m.), a former volcano. The old crater is, besides others, filled out with kaolin sands exposed by the former mining activities in the quarries. It lies to the east of the village of Jablonec. There is a fortress from the 14th century, rebuilt into a Renaissance chateau in 1607; today, however, it is dilapidating. Furthermore, it is possible to see the Romanesque Church of St John the Baptist, a Celtic burial site in the south; several findings from the area come from the Bronze Age.